Ready-to-use with pre-attached elastic string, pre-numbered with large bold digits. Easy to read & ready to use! 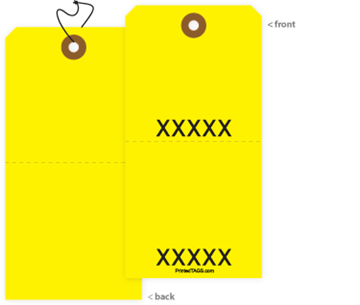 This highly visible Yellow Tear-Off Stub Tag is pre-numbered with larger bold digits and has elastic string attached. Tag size: 6-1/4" x 3-1/8"
Easy to read - pre-numbered with larger bold digits. 3/8-inch numbers printed above and below the perforation. Ready for use - knotted elastic string is pre-attached. Perforated for removal of stub. Includes a fiber reinforcement for added durability. Sold in shrink wrapped packages of 50.